My work explores the relationship between humanity and the natural world where nature is challenged, contorted, filtered and reborn. Landscape and botanical elements are the impetus for my work as they are a familiar reality we acknowledge. My perceptions of these often-misinterpreted genera begin to layer with my personal relationships, events and experiences and I find a new place for exploration and growth of ideas. I attempt to use natural elements in my work to define place for the viewer, in addition evoking memory and a comfort that have historically been linked to the traditional landscape narrative. In this work, I am interested in conveying a tension between domesticity and nature, the perceived and reality, the familiar and the unexpected. I am always intrigued with presenting beauty with elements that challenge the viewer to question what lurks beneath. It is at this point that the work begins to take on a persona of botanic magic realism forcing the exploration of personal relationships and events in an alternative context. The exchange that takes place with visual images, memory and perceived past converges within my work resulting in an ongoing multi-layered visual narrative. The botanic work becomes self-selective about what is represented, calling out the difference between the collective knowledge and individual experience. 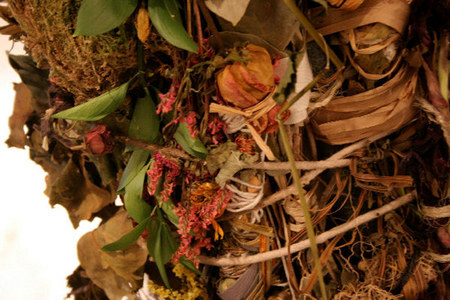 Using conceptually based work on paper as well as sculptural installations that are created from locally sourced plants, as well as plant and soil pigments that I make while visiting various locations throughout the U.S. I strive to create a direct connection between the events, relationships and the materials. continually try to weave the strings of art and agriculture and myth and magic, healing and hurting into an inquisitive whole that calls us to look at germination of a sustainable future both individually and collectively.